The mod was tested on the Euro Truck Simulator 2 version of patch 1.34 in DirectX mode, work on other versions is not guaranteed. In mods, with the permission of the author, there are some materials from AlexeyP, Piva, Donovan and Vasily EVR. Attention, before updating the mod, be sure to finish all the shipping and sell the old truck !!! Attention, if you are using a mod for physics – in the mod manager, install the mod on physics BELOW addons DAF_XF_by_vadik_v.6.5 and Kraker/NTM_for_the DAF XF by vad&k !!! 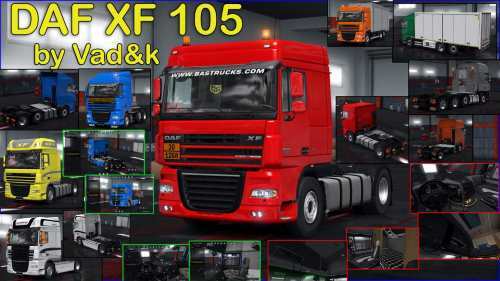 Attention, if you use the adapted physics for the DAF XF105 mod from vad & k, do not forget to make changes to the configuration files that are in the defvehicletruckdaf.xfchassis and defvehicletruckdaf.xfcabin !! !